On the Wings of a Buffalo or "Mother Teressa's Wings"
Buffalo wings have been so ingrained in our national food culture that it is hard to remember life before wings. But like "One Man, One Vote," Buffalo wings have been around for a lot shorter time than most people think. From the origin in 1964 to today, however, wings are a prime example of a food that incorporates so many of the traits our culture is known for. Thrift - wings, after all, come from the part of the chicken most people threw away or used only for soups and stocks. Ingenuity - the combination of simple, at-hand materials to make a new item. Eating with your hands - while most of us are quite familiar with our principal utensils of fork and knife, there is that childlike satisfaction in eating with fingers, especially when there is a flavorful sauce to lick off. There is something for most people to like about Buffalo wings and for those many reasons the food has spread rapidly from its origin in Buffalo, New York, and is now part of our national food culture, no longer something you can find only in the Northeastern United States. Perhaps the simplest way to discuss the origin and diffusion of Buffalo wings is to stick to a chronology. Most people who have even thought about the origin have heard and believe the first version of the legend . Teressa and Frank Bellisimo owned the Anchor Bar in Buffalo, NY. In this version, she invented Buffalo chicken wings in 1964 when her son Dominic and his friends came to the bar looking for a quick late night snack. "Mother Teressa" (Buffalonians take their wings very seriously) was preparing to make chicken stock with a bunch of wings and, improvising, stuck them under the broiler (later they switched to deep frying), sprinkled them with a hot sauce she concocted from a commercially available base (Frank's), took some celery sticks off the antipasto dishes, put some blue cheese dressing (the house dressing) in a small bowl and served them. All the principals are now deceased, but Dominic, who took over the bar from his parents, told the story differently to Calvin Trillin (1980) of the New Yorker magazine. According to Dominic, it was Friday night in the bar and since people were buying a lot of drinks he wanted to do something nice for them at midnight when the mostly Catholic patrons would be able to eat meat again. So, according to this version, Dom did not stop by with his friends, he was trying to be the good host at the bar. It was still Terressa who came up with the idea. Frank told a third story. It involved a mis-delivery of wings instead backs and necks for making the bar's spaghetti sauce. Faced with this unexpected resource, he says he asked Teressa to do something with them. Although the details are a little different, none of the tellers ever seemed too upset about the other versions. After all, the bar was a family affair and so were the wings it has become famous for. It was Frank who was memorialized in the 1977 City of Buffalo proclamation of July 29 as Chicken Wing Day, though. A fourth version of the legend was reported by Calvin Trillin of the New Yorker magazine in 1980 but it appears nowhere else in the published references to Buffalo wings. Trillin reported on an African-American named John Young who said he developed a special "mambo sauce." Chicken wings in mambo sauce became the specialty at his Buffalo restaurant in the mid-sixties. He registered the name of his restaurant, John Young's Wings 'n Things, at the county courthouse before leaving Buffalo in 1970. "If the Anchor Bar was selling chicken wings nobody in Buffalo knew about it then," according to Young. Trillin checked with a local poultry distributor and found that both John Young and Frank Bellissimo were buying a lot of chicken wings in the middle sixties but no sales receipts were saved. The wings Young sold, however, were prepared a little differently. They were not cut in half (the tip is removed first usually in Buffalo wings) and were served breaded with the sauce covering them rather than being tossed in the sauce. In 1980 they were still being served that way in John Young's Wings 'n Things (he had returned to Buffalo by then) and in a restaurant owned by his brother, Bird Land. No telephone listings for either restaurant could be found in 1997. Nobody seems bothered about the variations in the stories of how things happened, though. What is clear that is was the early to mid-1960s (1964 according to the Bellissimos) and it was in Buffalo, New York. Like some of the other foods that may have originated in the region, the point of origin has become almost a shrine to the item. While the Anchor Bar still serves a local clientele, its place in food history draws visitors from around the world. Many leave one of their license plates which they have attached to the wall. There is a small glass case where they sell T-shirts, baseball caps and other memorabilia such as you might purchase at a baseball stadium. And the takeout sales of Anchor Bar Buffalo wings sauce are very brisk and lucrative. On the weekends and in the summer the lines are long for takeout wings from the bar and it has become an important tourist destination in Buffalo. 1964 - 1975 -During this period almost nothing was written about Buffalo wings.. Trillin noted that he could find only one article (1969) about the Anchor Bar in local newspapers and that dealt with the musicians who had appeared there - nothing about the wings. 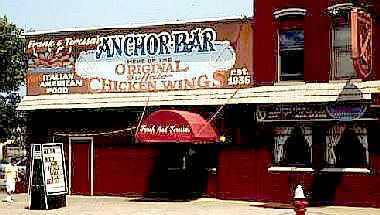 Most of the later discussions do claim that other Buffalo restaurants and bars quickly imitated the Anchor Bar and it was clearly spreading around Buffalo quickly during this period and probably to other towns and cities in western and central New York state. There are some references to Buffalonians leaving Buffalo and taking the wings with them - to Paco's Tacos outlets around Boston (no longer there) and several references to South Florida. 1975 By this time the South Florida connection with retirement migrations from Buffalo is clear. Edmund J. Hauck of Buffalo started Wings N'Curls in 1975, the first chain of restaurants specializing in wings, and by 1992 the company had grown to 18 units in Florida, Indiana, and California. That chain served wings with several different sauces although the Buffalo wings were by far the most popular. Hauck later sold out and the restaurants all became individually owned and only the first one still carries the name (Knaak, 1998). 1975-1980 There was clearly significant growth in this period but little evidence I could find. One person writing into a wings web page spoke of a chain in Syracuse around since at least 1976. There are no recipes for them in national women's magazines during this period. Craig Claiborne and Pierre Franey (food writers for the New York Times Magazine) had a one-page, three-recipe article on wings in January, 1979, that made no mention of Buffalo wings but in 1980-81 the national food press began to notice wings. 1980-81 When the national press gets hold of an idea it spreads quickly. In Trillin's article he claims there was a reference by Craig Claiborne to the "excellence" of Buffalo wings a year earlier but I could not find it. Trillin's article itself and the 1981 one-page recipe and brief discussion in the New York Times Magazine by Claiborne and Franey clearly brought Buffalo wings to a national audience. The restaurant trade press does not appear to have really noticed wings up to this point..
1983 - The Hooters restaurant chain is founded with chicken wings central to the menu, including the notion of three levels of hotness in the sauce. The Hooter's (small) history page on the world-wide web mentions a Midwestern origins of the chain's founders but the headquarters location in Clearwater, FL, suggests the strength of the south Florida outlier region at that time. Hooters has since spread nationally spreading the wings with them. In the quest for the "best" wings Hooters has detractors and supporters; few wing nuts are ambivalent about the wings sold there. Late 1980's - Several recipes and brief discussions of wings appear in national magazines such as Ebony, Esquire, and Family Circle. In the last article the writer remarked on how "Buffalo wings have quickly become a favorite across the US." So the period from 1980 to 1988 was clearly one of rapid growth and expansion but the documentation is weak. 1992 - This was a good year for the national spread of Buffalo wings. The first national pizza chain, Domino's, introduced them in their restaurants in Buffalo. According to one page for Buffalo wings (see the Links section) this practice was already widespread in the non-chain pizza restaurants of Buffalo. Recipes and discussions of the origin of wings appear in three national magazines. Nov. 1994 - Domino's goes national with buffalo wings. A different report claimed they went national in April of 1994. For the National Football League games on NBC that season the company committed $32 million of advertising and ordered new television advertisements for May, 1995 showing a winged bison coming in for a landing. Feb. 1995 - Pizza Hut follows with national distribution of wings. These adoptions of wings were later described as test marketing. Mar. 1995 - Domino's claims that 1/5 of all orders included wings by this time. Little Caesar's, a third national chain, is taking a wait and see attitude with wings available in only 200 of 4,700 outlets, not convinced yet that the food has gone "national." June 1995 - Domino's reports that 1/3 of customers are ordering wings. July 1995 - Restaurants and Institutions lists a wing franchise, Buffalo Wild Wings & Weck as one of the thirteen newcomers to their 400 list. This chain also provides another Buffalo food item, beef-on-weck, a sliced beef sandwich on a salted roll. Also known as BW-3, the franchise core is Ohio but there are a few outlets in Florida, Texas and Colorado as well as those shown on the map. It iwasthe largest of the franchise wings companies with over 90 outlets in 1998. The company has sinced changed its name and dropped the "weck" because so few people knew what it meant. There are now (May 2002) over 150 outlets of Buffalo Wilds Wings Grill and Bar with headquarters in Minneapolis. Nov. 1995 - The National Broiler Council estimates Domino's is selling 10 million wings a week. According to figures from Pizza Hut, Buffalo wings have grown into a $400 million category with a 20% growth rate, which represents a lot of money in the $18 billion a year US pizza industry. There are places where true wing-freaks say they cannot get good wings in this country but the Buffalo wing has flown far from its northeastern origins (see map of favorite wing sites) although there are many who claim that Buffalo is the only place you can get real wings. Buffalo wings are now an item in the national food culture and it would be difficult to identify regions where they were eaten in greater proportions than others. In other words, the Buffalo wing region may have a diffusion center and a core but no periphery. In an attempt to identify a core, however, I have made use of the internet. There is a Buffalo wings site where people can submit their "vote" for the best Buffalo wings. I counted the listings for March, 1996 and January, 1997 and 180 different people cast their votes for the "best Buffalo Wings." Removing the chains, national and regional, from the list, there were 150 votes cast and 30 of them (20%) of them were for eleven different restaurants in or near Buffalo. Buffalo is still the core of the region. The Northeastern United States, particularly New York State and Pennsylvania, is still a region where you are more likely to find excellent Buffalo wings. Of the non-chain restaurants identified as serving the "best", 60% of the votes went to restaurants in the Northeast. The second map shows the locations of these restaurants in the region. So while this thirty-four year old food item that originated in the region is still strong in the Northeast, it has spread quite far. In the two months of "best wing" voting, votes came in for restaurants in Hawaii, nine cities all over Canada and Singapore, although the reviewer did admit the sauce was a little different. For its size, California seems to have few wings places people rave over. New England is mostly a wings desert and the Southwest, with its own spicy food customs, hardly shows up at all. I do not mean to say that you can't get good wings almost anywhere in the United States, but just that people who know wings, commune with the wings web site and organize their vacations around finding good chicken wing spots, some regions do not seem to be in the running. Competition is a strong American trait and our competitive nature is revealed in the oddest places. So please don't send me your comments about chicken wings. I only had time to look at two months worth of listings of the "Best of Wings" site and probably missed your personal favorite. However, as the map below show you can get good wings in much of the country so go out and enjoy. "Best Buffalo Wings East of Mr. B's"
One of the computers at the State Univ. of Buffalo is named "wings"
Wings; Perdue's basketball nuggets take center court; and BG Lobster & Shrimp presents breaded calamari rings.The National provisioner. Vol. 209 No. 5 May: 22. Anon. 1995. On a wing and a pizza. Restaurant Hospitality Vol. 79 No. 6 June:28. Anon. 1995.Pizza chains wing it.Restaurants & Institutions. Vol. 105 No. 18 July 15:68. Anon. 1996.Classics - how to make Buffalo chicken wings.Restaurant hospitality. Vol. 80 No. 12 December 1:93. Anon. 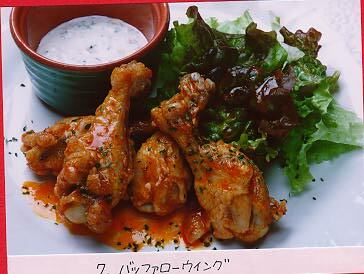 1994.Chicken with an accent - Globe-trotting Buffalo wings Restaurants & Institutions. Vol. 104 No. 22 September 15:93. Benezra, K. 1994. Wings & pigskin for Domino's.Brandweek Vol 35 No. 17 April 25:10. Brooks, P. 1988. Let's wing it.Family Circle Vol. 101 No. 8, June 7:61-63. Chernetz, B. 1992. The chicken lover's cookbook. McCall's Vol. 120 No. 1 October:164-168. Ferrary, J. 1992. Mother Theressa's wings. Travel-Holiday Vol 175 No. 5 June:31. Ferretti, F. 1992. A Gourmet at large : from Buffalo's chicken wings ... to South Philly's Italian market. Gourmet Vol. 52 No. 5, May:95. Fuller, K. 1992. Chicken: 20 best recipes from coast to coast. Better Homes & Gardens. Vol 70 No. 5 May:150-163. Furet, D. 1994. Latest food items are hot commodities among concessionaires. Amusement Business Vol 106 No.11 March 14-20:30-31. Knaak, Mary.July 29, 1998. Co-owner of last Wings N Curls in Hollywood, FL. Personal communication. Kochilas, D. 1992. RB menu ideas : wingin' it. Restaurant Business Vol 91 No. 7 May 1:158-159. Lyons, C.1990. Fast food ... at home.Ebony Vol. 45 No. 10 August:98-105. Mariani, J. 1990. You ate it here first. Esquire Vol. 114 No. 6 December:202. Rubel, C. 1995. Pizza chains winging it.Marketing News Vol.9 No. 7 March 27:1,15. Rucker, A. 1995. Appetizers that score big. Southern Living Vol 30 No. 9 September:130-132. Ruggless, R. 1996 From our kitchen to their delivery van to you. Nation's Restaurant News Vol. 30 No. 23 Jun 10:8. Spence, M. 1995. Fresh to the 400.Restaurants & Institutions Vol. 105 No. 16 July 1:134-136. Trillin, Calvin. 1980. U.S. Journal: Buffalo, N.Y. An attempt to complile a short history of the Buffalo chicken wing. The New Yorker. Aug. 25: 82-87.